Once we reached about 10,000 feet elevation all of a sudden the terrain abruptly changed. I am not sure if this is altitude related or not, but the forest just gave way to a meadow. Webb pointed out that it reminded him a lot of Tennessee farms. 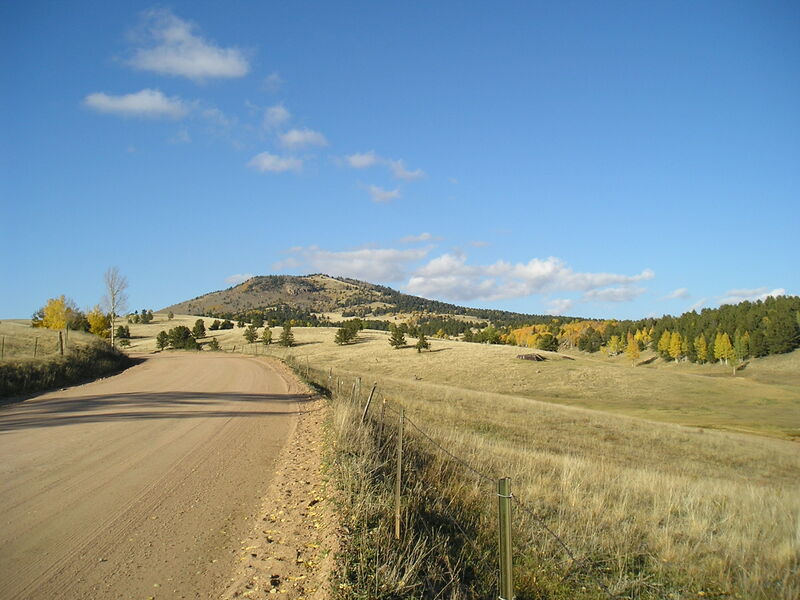 This is a distant view of Victor, Colorado. The town sits below the tailings of a former large gold mine. This reminds me of mountain top removal mining in KY, the entire mountain in some areas seemed to be nothing but a pile of rubble, and often we know that these areas are poisoned with heavy metals and other waste from the gold mines. 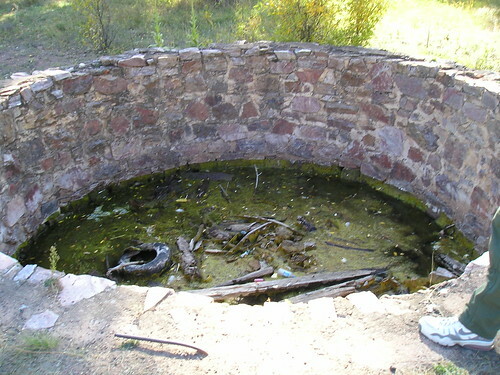 To continue the similarities the leftover rubble from the mines are often dumped into valley fills. 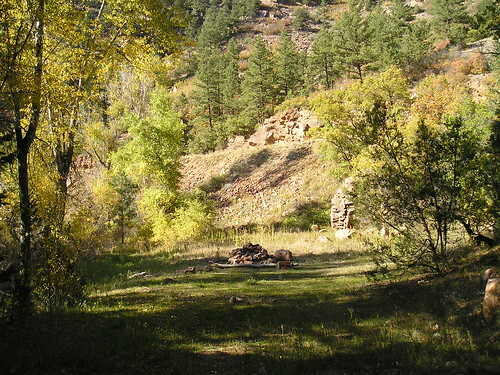 Below is a photo of one of the mines near Victor and Cripple Creek. Notice the similarities to Mountaintop Removal mining in Appalachia. 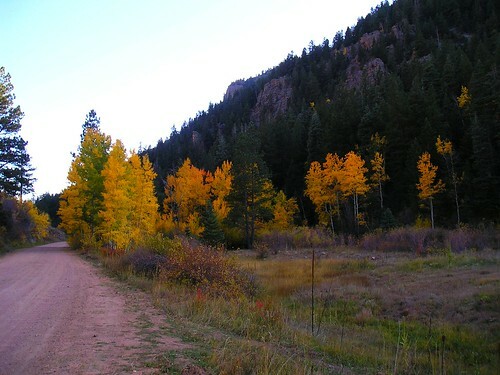 Since it was getting dark and late we decided to drive Northeast to Colorado Springs to access an actual paved highway. 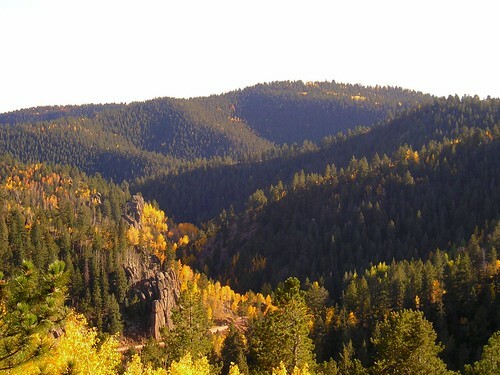 We came around the Western side of Pikes Peak through Woodland Park. 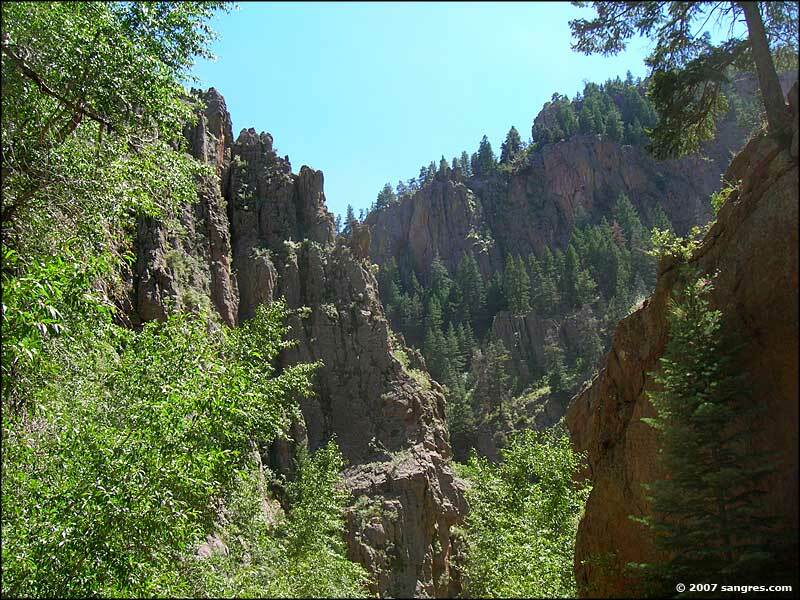 Below is an image of Pikes Peak viewed from Woodland Park, Co.
ore photos from our recent trip through Phantom Canyon, CO! In this part of the canyon we are starting to really get up there in elevation. Canon City is 5,332 ft. 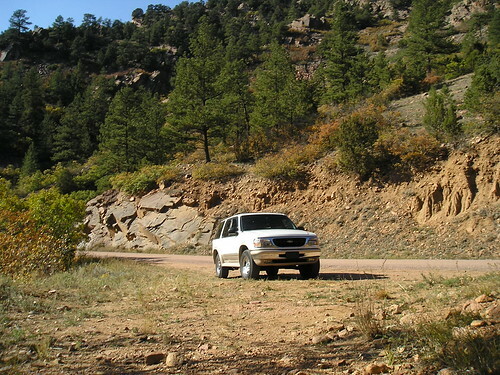 The road climbs slowly, but for reference at the end of the road we are at nearly 10,000 ft.
A picture of our SUV (gas-guzzler 🙂 ) on the side of the road, looks like a commercial. Ford trucks!!! 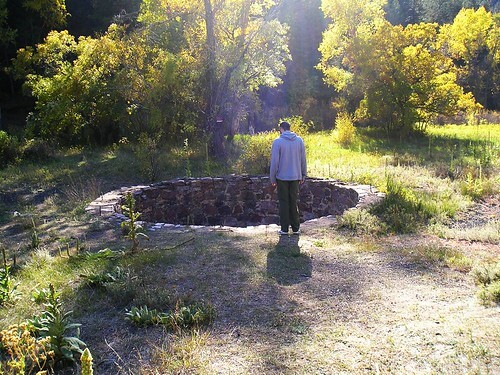 We found this strange pit mysteriously near the roadside. Don’t know what it’s purpose was. Mostly I just hoped no one ever fell in, because it was filled with nastiness. There was nothing around to explain what this thing was doing out here in the middle of NOWHERE. 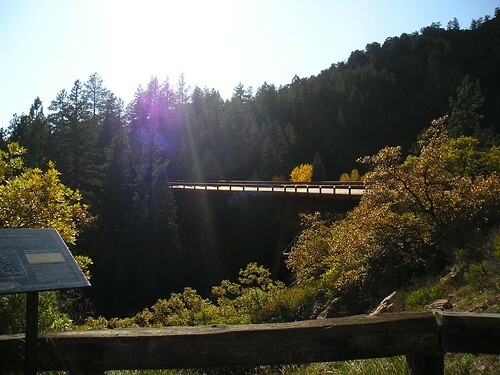 This is the only remaining original bridge along this road. More road through the canyon. 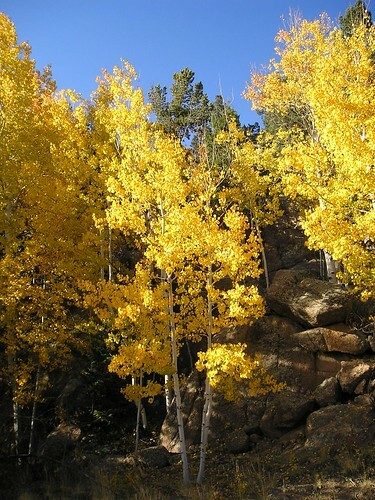 These are Quaking Aspen. They grow in colonies and share a root system. 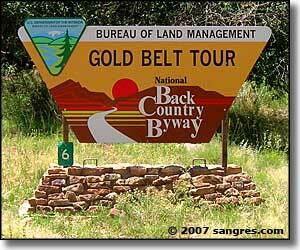 There were signs along the road marking where towns used to be during the gold rush. All of these towns have since disappeared without a trace. 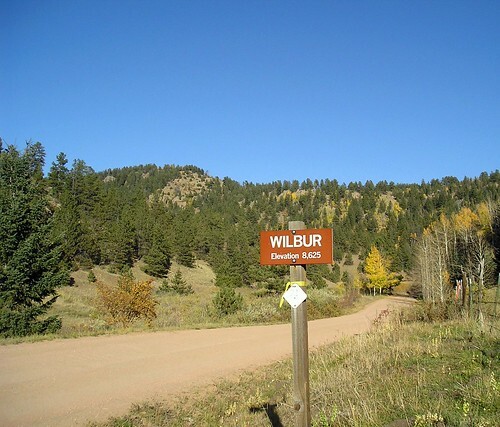 As you know this area of Colorado is famous for it’s major fossil discoveries including a practically complete stegosaurus fossil. Amazingly we discovered perfectly preserved dinosaur remains in the woods!!! The view at almost 9,000 feet. 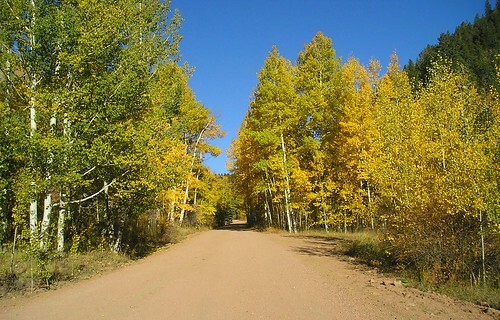 You can see the road we drove in on down below as well and the Aspen which tend to follow the creek bed. 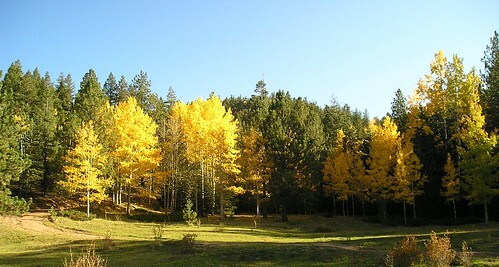 Amazingly it is entirely possible that ALL of the yellow Aspens you see in this photo are part of a single root structure. 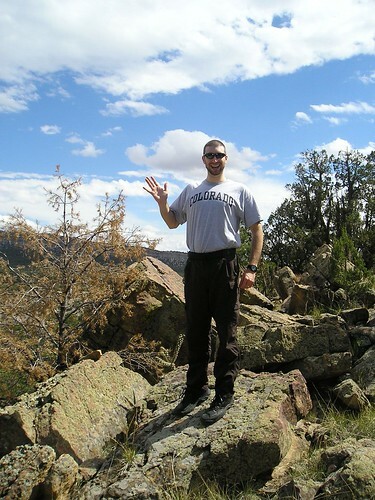 Of course, Webb waves at the camera from the scenic overlook. It is cold so we keep our hands in our pockets. 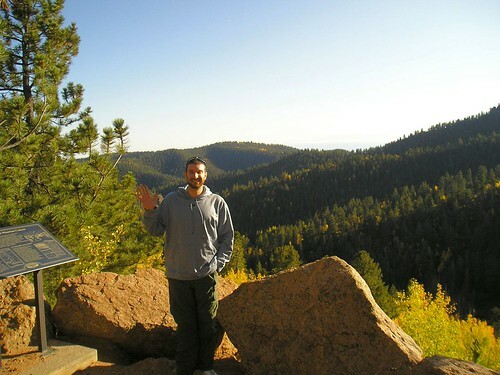 Finally a trip up Phantom Canyon!!! 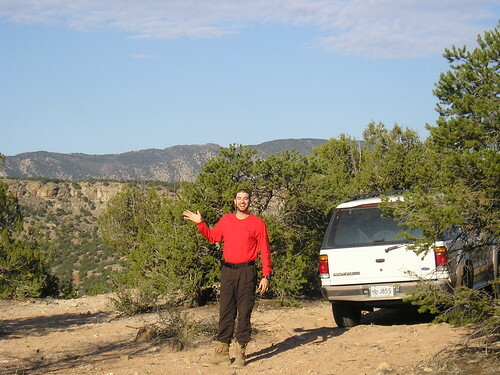 Here’s some information about the tour from Sangres.com which has a lot of pictures and info about the gold Belt Tour and the surrounding area. This was a great resource for us while planning this trip. 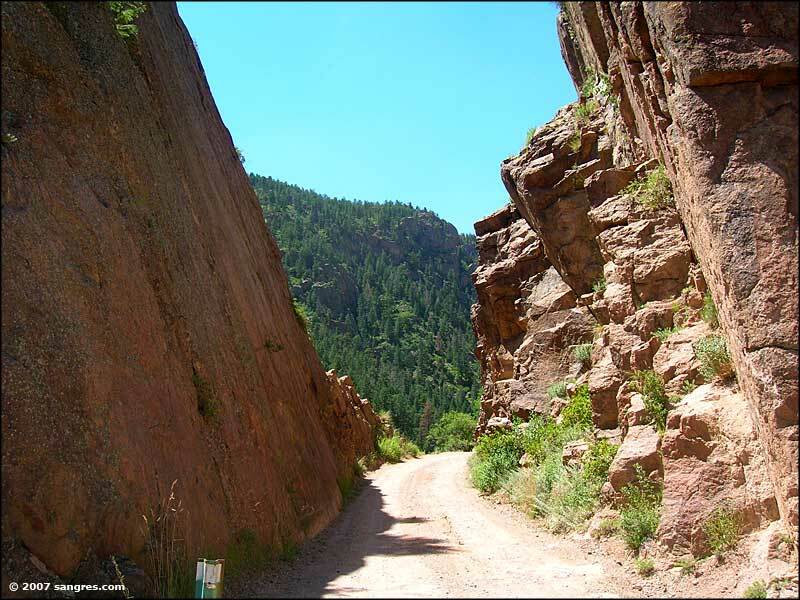 Phantom Canyon Road was built to connect Florence, CO to the mines in Cripple Creek and the surrounding area. 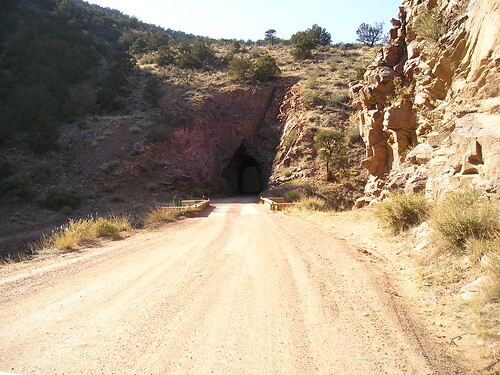 From 1894 to 1912, railroad cars filled with gold ore rolled down Phantom Canyon feeding up to nine processing mills running day and night in Florence. 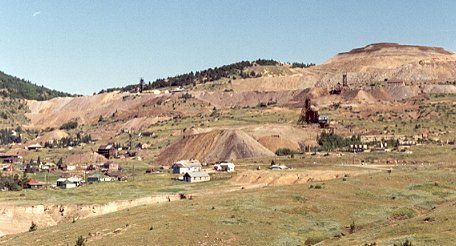 It was 1890 when Bob Womack made the gold strike that started the Cripple Creek Gold Rush. 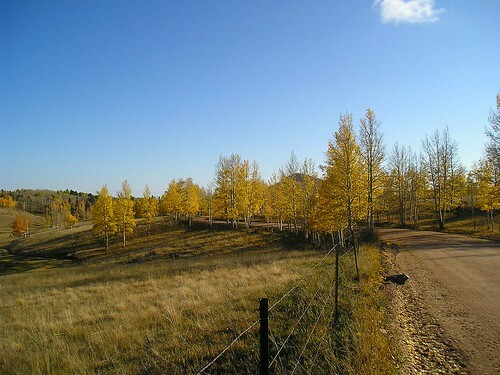 Since that time, more than 500 mines in the Cripple Creek and Victor Mining District have produced over 21 million ounces of gold – more than the Alaska and California Gold Rushes put together. Gold is still being produced in the District. 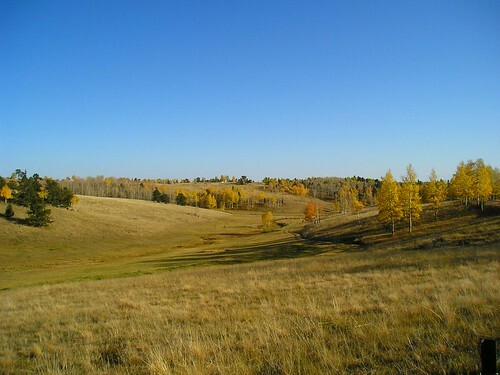 The terrain begins in the dessert-like scrub and makes some pretty intense transitions to thick evergreen and aspen cover and then to meadow up around 10,000 feet. The majority of the land along this route is owned by the Bureau of Land Management particularly on the lower portion of the road. 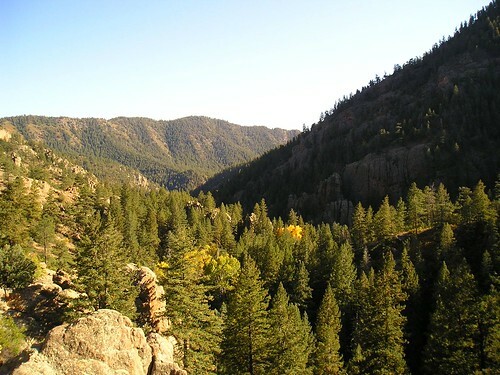 Since 1996, Phantom Canyon has been designated an Area of Critical Environmental Concern by the Bureau of Land Management. 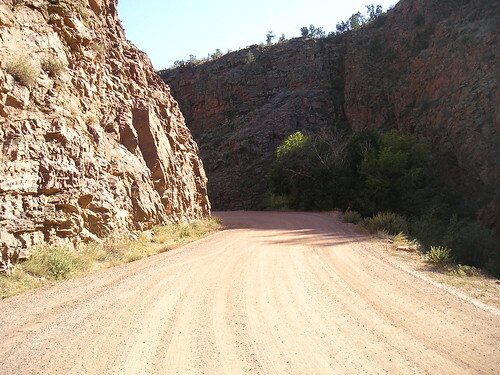 Here is a shot as we are entering the canyon as the blacktop becomes a dirt road. The green you see to the right is the path of the creek which carved this canyon. At the time the creek is barely 3 feet wide and patchy (even following a pretty recent rainfall) but there are numerous reports of 30 foot flash floods racing down the canyon. 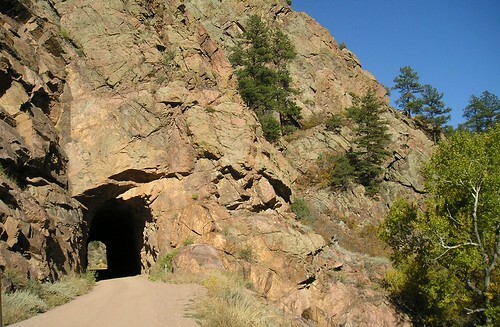 There are two tunnels along this route, the Upper and Lower Tunnel. 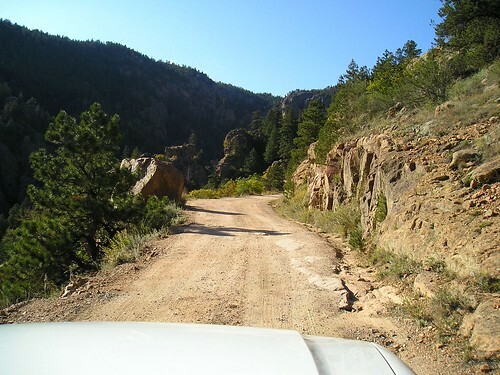 The entire road is a converted narrow-gauge railroad path. There are some pretty steep drops, especially as you emerge from the upper Tunnel. This next picture shows one of the cuts blasted out for the railway. There is literally only room for one car here, and just beyond there is a sharp curve and STRAIGHT down. We were very fortunate to encounter another truck just as we emerged from this spot…of course we took the right side allowing the oncoming vehicle to risk sliding off the edge. Notice how the trees have changed to evergreens…big tall ones! Up further we pulled off and explored some of the camping, hiking in the area and found this creek and large fire pit. We went camping again this weekend. Unfortunately I forgot to bring my camera this time. We weren’t actually planning on going, but when Webb came home from work we just threw everything in the car in less than 15 minutes and hit the road. Pack-up, set-up, and take-down are super fast now that we know the routine. Plus our tent is super easy to put up even with just one person. 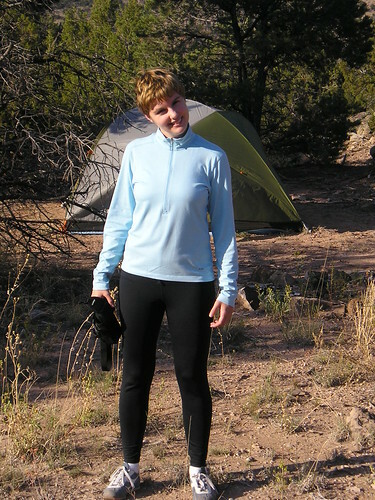 We camped at the same place we did last time and actually got a good night’s sleep. It actually wasn’t that cold out there, about 49 degrees. Since the moon didn’t rise until maybe 1am that night and it was clear you could see the stars very well, we saw several shooting stars. In the morning we packed everything up and drove a different way out to see if the road eventually looped around…unfortunately after a terrifying ride (steep and rocky) the road simply ended with no place to turn around. Thrilling, especially when we were discussing how we might possibly get stuck out there and what we would do. We managed to turn the car around without breaking anything and clawed our way back out. Tonight we went to Pueblo and ate sushi with our friends Angie and Steven. Very very good. We went to a restaurant named MoMo in Pueblo, I would have to say that the Las Vegas Roll was the yummiest of all the many yummy rolls. I also learned that you can disolve wasabi in your soy sauce and it is very tasty. For dessert I had Green Tea Ice Cream which sounds very strange but tasted really great. We’ll definitely being going there for special occasions in the future. Unfortunately I forgot to bring my camera, and therefor have no picture of the nasty disgusting Wind Scorpion which Steven caught in their HOUSE?!??! Egad!!! Sun Spiders/Wind Scorpions/Solpugids Sun spiders are bizarre looking arachnids (Order: Solifugae) most common to southeastern Colorado. Occasionally they are found along the Front Range. They possess large conspicuous jaws used to crush prey, but they do not have venom glands. Also present are prominent enlargements of the mouthparts (palps) that give the impression of a fifth pair of legs. Sun spiders are active animals, and a common name ‘wind scorpion’ reflects this behavior. They occasionally enter buildings, particularly in early summer. We had our spot all picked out, but when we got out there someone was already there parked behind a tree doing God knows what. So we went about 2 miles further back into the area and found the most awesome campsite ever. We will definitely be returning to this location for future camp-outs. It’s on the top of a hill over looking the canyon. Off in the distance to the south you could see some lights from Canon City twinkling in the distance. 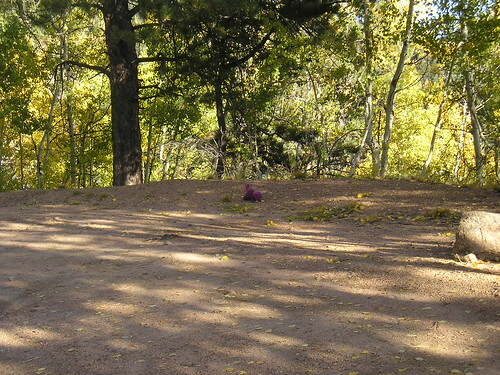 It had a great fire pit already built and used, flat vegetation-free ground, and a nice little pull in for the car. It was GREAT. When we first arrived it was raining (barely). Enough to make us re-think our decision, but it stopped right after we got the tent set up and the fire lit. 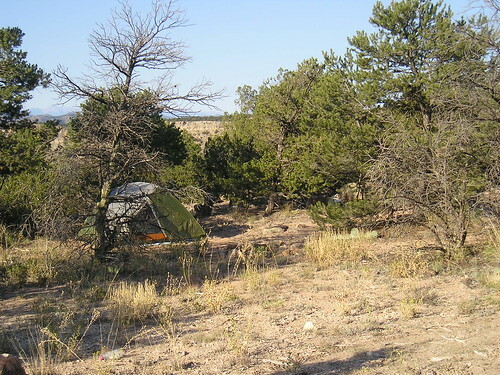 The only drawback was that it was almost too quiet at night, and every sound was the sound of a bear or mountain lion contemplating ripping open the tent and having a midnight snack. This is where the tent was, actually very comfortable. 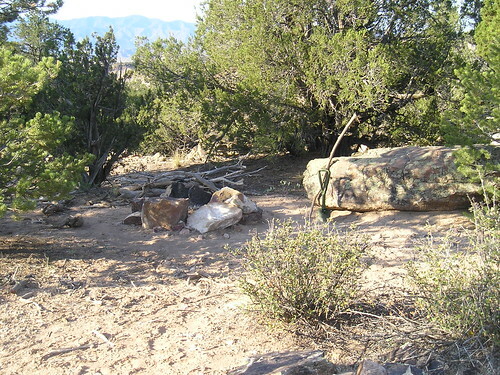 This is where the fire-pit was, very cozy, and you could sit on the big rock to the left. The sun was shining so brightly that Webb couldn’t open his eyes to see who he was waving to. One thing that I noticed when we were out in the BLM area exploring was that there is a lot of trash. Most decent outdoors people (and even regular folks) follow the Leave No Trace principle which is essentially exactly what it says, don’t litter, don’t mess up the ecosystem. 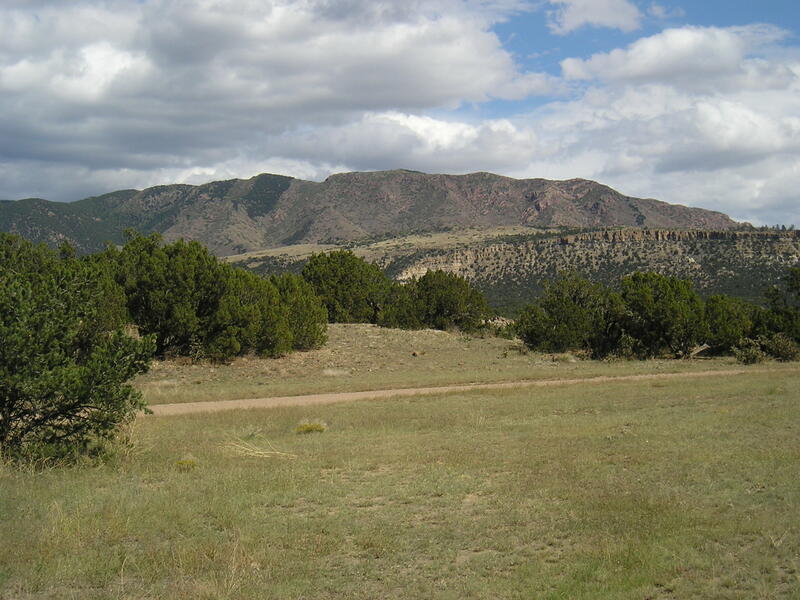 BLM lands are public lands with fairly loose restrictions on their usage. 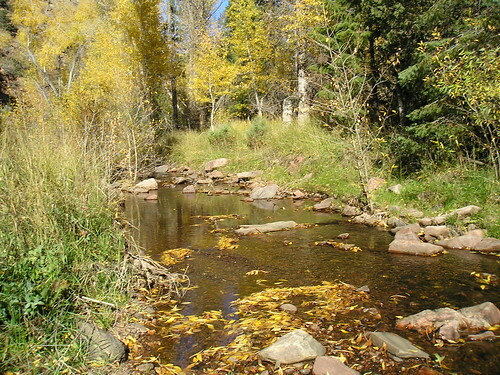 For example, ATVs are allowed, you can go backcountry camping there. But it seems that this is also that place I mentioned before up in the canyon where the losers go to get drunk and party. 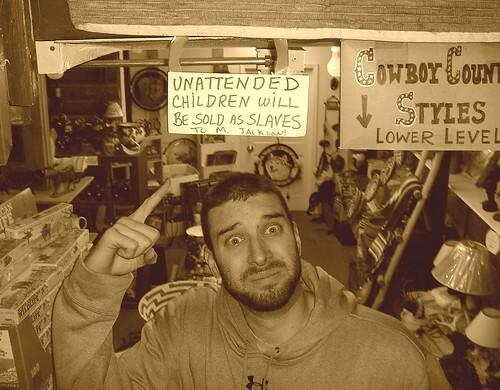 Which honestly i’m fine with, except there is broken glass ALL over the place. Back in the woods you can tell people found a nice place to hang out and trashed it. Plastic litter and broken fifths of vodka. It’s really sad and ugly, and well, dangerous too. The fact that the area in general is so beautiful makes the trash stick out even more. Next time I go out there I’m bringing a big ole’ garbage bag, maybe I can at least pick up the plastic stuff. Giant ant hill. Pretty normal out here. We have one bigger than this in our front yard by the road, but since school has started the kids walking home from school have been messing with it… BAD KIDS get out of my yard! 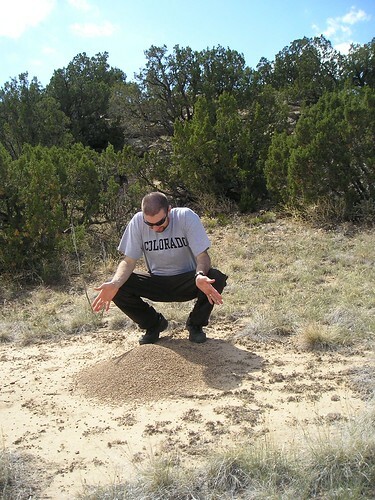 Only I can play with the ant hill. As you know Webb loves to wave at the camera. I would say that he’s a dork, but that would be rude. 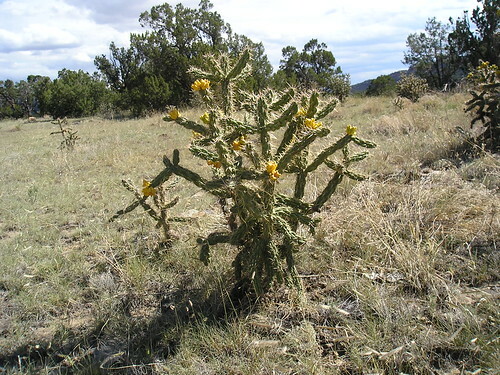 After the cacti bloom in June/July the flowers fall off and the ends are green, but in the Fall they turn yellow. Pretty.